Those amazing scenes from "Skyfall". How were they shot? 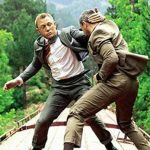 Shanghai scene: the mercenary "Patrice" assassinates the art collector with a sniper then "Bond" kills him. The opening shot was done on a moving train on a line we had dedicated for shooting in Eastern Turkey near Adana. The actors were cabled and the cable removed in post. 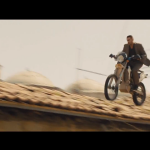 The bike sequence was shot on the roof of the Grand Bazaar in Istanbul with a stunt rider. A couple of images were done with face replacement. The Shanghai Glass Office complex was shot on the 007 stage in Pinewood studios in London. Everything in the scene was done in camera except for the street below where you can see traffic moving. Otherwise the background was a forced perspective set with back lit Translight screens standing in for the far distance skyline. Roger Deakins replied to sam mendes WWI one long take 10 hours ago It is fun to speculate!